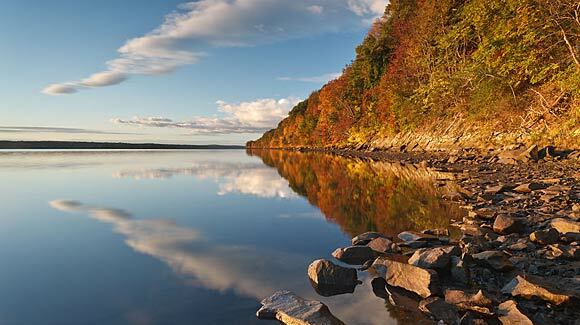 Hudson River shoreline at Falling Waters Preserve.Robert Rodriguez, Jr. This stunning landscape features over a mile of unspoiled Hudson Riverfront as well as a stream, meadow, wetlands and hardwood forest. In addition to affording spectacular views of the river and Catskill Mountains, the land is prominently visible from popular tourist destinations such as Clermont State Historic Site, Montgomery Place and the Tivoli Bays National Estuarine Research Reserve. Working closely with the Dominican Sisters of Sparkill (who generously donated a five-year conservation restriction on their property) and Saving the Land That Matters Most partner the Esopus Creek Conservancy, Scenic Hudson has now created the Falling Waters Preserve, augmenting an existing riverside trail system with new public pathways traversing upland terrain. A portion of the protected property safeguards Saugerties Marsh, which provides critical fish and waterfowl habitat.